But there’s a special kind of hell for colleagues of journalists who pass away in unsatisfactorily explained circumstances. In countries where violent, secretive men who hate your work, hold sway, and act with impunity. When cheap conspiracy theories disgust you, and the allegation of paranoia embarrasses. Yet you would be doing her life work an injustice not to at least consider the prospect. It would be disrespectful to underestimate the impact of her efforts to bring good journalism to bear on the bad man’s work. Or his capacity to do evil, so carefully documented by you and her over the decades. And most of all, you agonise whether such speculation merely opens up new chasms of despair for her loved ones, who have quite enough to think about without being forced to play with her glib friend’s James Bond scenarios. And so all this was and is in the case of my friend and colleague Jacky Sutton, found dead at Istanbul’s Ataturk Airport on 17 October. She was in transit from London to her base in Erbil in the Kurdish region of Iraq. Jacky had taken over as acting country director in Iraq for the Institute for War & Peace Reporting (IWPR) at the end of June. She had stepped in when Ammar Al Shahbander, then IWPR’s country director and mutual friend to us both, was killed in a car bomb attack on May 2. Jacky had been in London to join Ammar’s family and friends at a memorial at St Bride’s Church in Fleet Street last week. 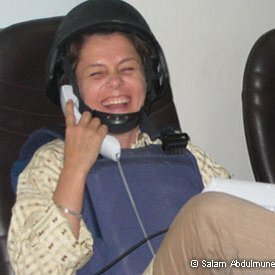 I worked closely with her in Iraq on a media and elections project for UNDP in Baghdad and later when she worked with the US media development group IREX and again during her time as a consultant with the US International Foundation for Electoral Systems in Baghdad. 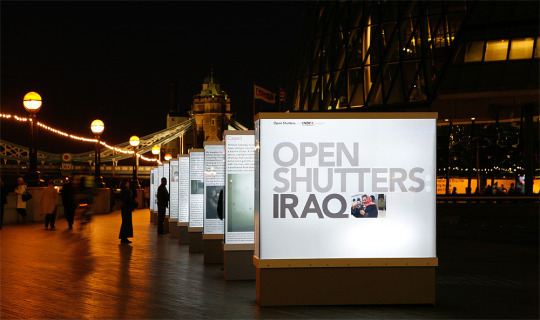 Our work in Iraq was diverse, sometimes dangerous, but mostly I’d thank her for the support she gave me in finding UN funds to bring the Iraq war home to England, by staging Open Shutters Iraq, an open-air London exhibition of photos by Iraqi women taken during 2006/7, coordinated by Eugenie Dolberg. We had Facebook-chatted the week before her death about returning to college study in our 50s; Jacky was working on a PhD on Afghan and Iraqi women journalists at the Centre for Arab and Islamic Studies at the Australian National University in Canberra. I couldn’t get to Ammar’s memorial in London, so this week we planned to Skype and swop respective academic notes on media and extremist messaging. That is what I know. The rest is speculation. There’s a body of opinion in my trade, mostly held by ex-British squaddies turned war cameramen, and commentators on Russia Today, that the work that media development NGOs do in conflict zones is somehow of a lesser order than theirs. Not quite real “war journalism”. That it is devalued by the role proactive advocacy for human rights plays in its work; in its focus on the independent media (read partisan anti-government, for some); and that its funding sources, mainly western government aid and pro-democracy programmes, qualify its credibility. Well, whatever. 7.62mm rounds don’t bounce off printouts of project deliverables. And it doesn’t reduce the emotional stress of the work, the physical risk, the occasional isolation, or the existential threat the work poses to men, who as mentioned, have previous records for acts of violence with impunity. If anything, in this changing media world of networked journalism, it increases it. Airports are terrible places for people in our trades. For weeks before the mission there are long, distracting days of cramming human rights reports; budgets on Excel spreadsheets to pick apart; security to inspect, and so on. For weeks after there’s the adrenaline punch of not only doing a job you love, but doing it side by side by journalists whose courage defies belief or easy expression. But in between the two there is the purgatory of the check-in and departure gate. All the hopes and fears of scores of missions, run through the mind during that dumbly repeated walk across a boringly familiar concourse, scrunched up with old traumas and memories of lost friends. Troubled by the gnawing fear of failure, and the fatal consequences of a bad call, not for you, but worse, for a colleague. The steps past the duty free are the same every time, but the voices (Flee now while you still can! ), they do get louder. On One trip, I lost it at Gatwick Airport on my way to Moldova. Harmless place, but it wasn’t Chisinau that was on my mind at the time. Jacky Sutton walked through her personal Valley of the Shadow of Death many times, on Saturday via the transit hall at Istanbul Airport. I do not pretend to know, or dare to guess, what happened to her there that day. But I do know one thing: Jacky Sutton feared no evil. For advice for media workers of all kinds in handling personal security and trauma, please refer to the Dart Center for Journalism and Trauma (http://dartcenter.org) and the Rory Peck Trust (https://rorypecktrust.org). This article was originally published online by Little Atoms. The fee was donated a fund for the Nowzad Animal Shelter in Afghanistan (www.nowzad.com).